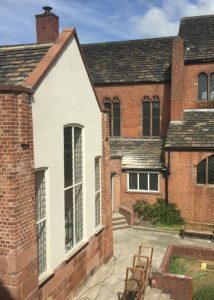 As part of the THI complimentary initiatives, the Greater Manchester Building Preservation Trust arranged for the restoration Architect Lisa McFarlane of Seven Architects to put on a session to explain and show the ongoing work that is being carried out in the school rooms. Little did we know that another of Lisa’s talents is baking. 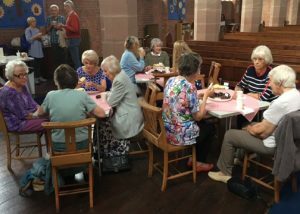 Along with her presentation she arrived with cake stands and chocolate and raspberry muffins and lemon cup cakes freshly baked. The session started with coffee and cakes followed by an introduction by GMBPT trustee Christine Grime followed by Lisa’s presentation showing the before and after images of the work done so far. The group were also given a tour of the safe areas, work was still in progress in some rooms (Saturday working). Important features were pointed out throughout the walk around the building. 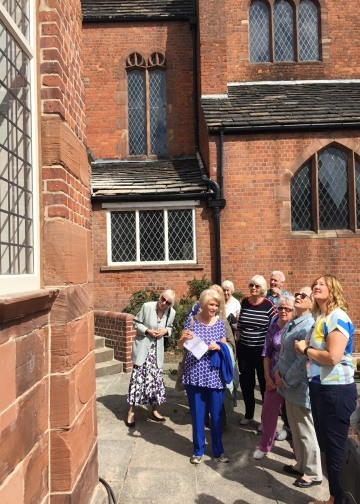 Lisa is on the right of the group and were having a long look at almost completely restored lecture room gable, which is looking rather smart. When the scaffold is removed from the Long Street elevation, the view through the arched gateway of the lecture room will be impressive.